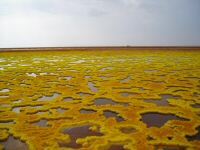 Visit the Dallol one of the hottest areas on earth home to the Afar tribe of Ethiopia. 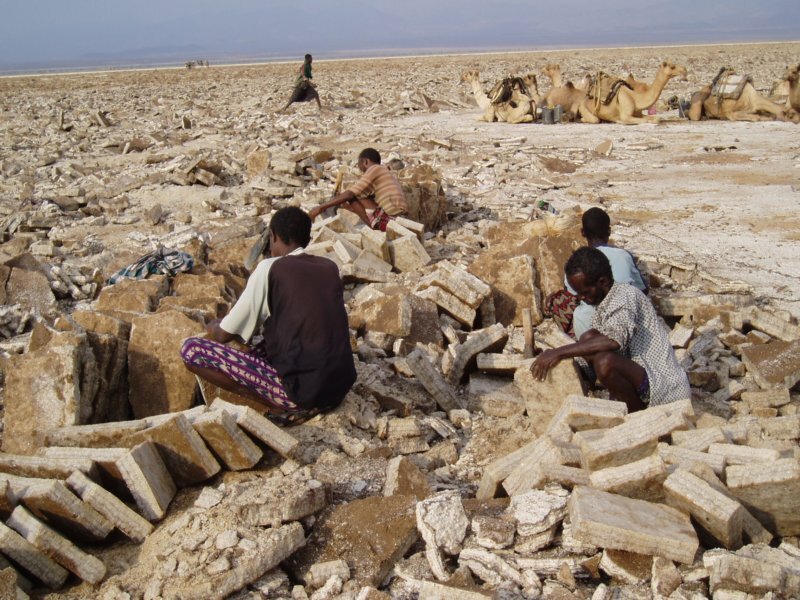 Witness the age old activity of salt cutting, then accompany the camels on part of their three day trek, back up to Mekele to the Salt Market. View the live volcano of Ataele by night, an unforgettable experience. 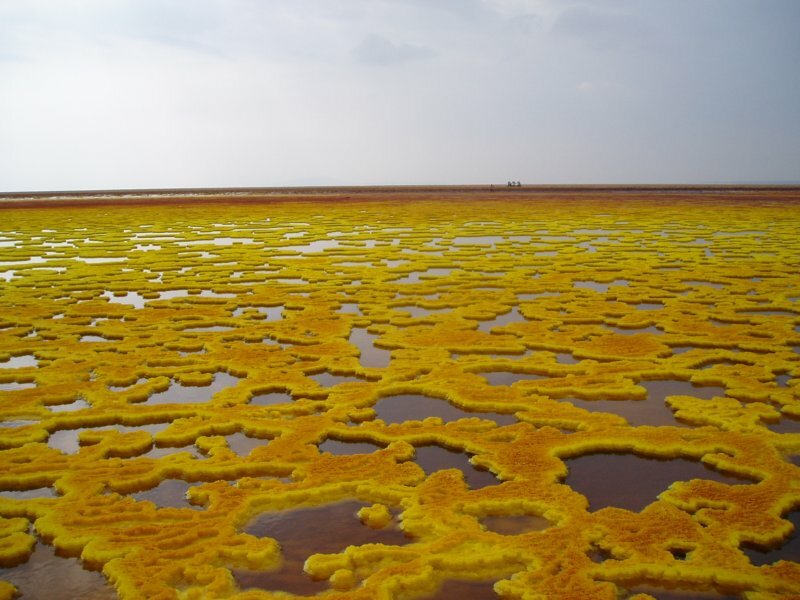 Getting to the Dallol is not the problem, but returning with a sense of humour could be, unless you use a reliable company like Solomon Berhe Tours. Transport is expensive in Ethiopia, and you definitely need a four-wheel drive for safety and comfort, with a second vehicle for back up.On a recent visit we only got stuck twice but met others digging out for the seventh time... At $180+ a day for vehicle hire, it is good to find friends to share the costs. You will also need space for the two Afar policemen and the tourist office guide ,whom the regional authority insist on accompanying you. This is despite having your own excellent guide, driver and appropriate pass papers. This isn't a hardship because a larger group creates a better atmosphere and a greater cultural experience. 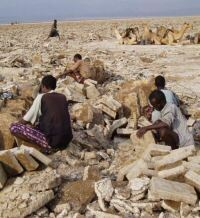 Our advice, if you have the time, is to do a circular trip and not take the more direct way along the salt route from Mekele. Travel via Awash, Asaita and the salt lake at Afrera, visiting one or two live volcanoes. 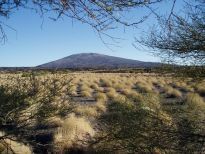 Camping overnight near the rim, allows you to witness the spectacular sight of a live volcano by night. 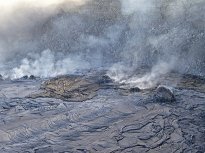 It is worth it to see the bubbling lava. Once in the depression, you may trek with the camels for some time, on their way up to Mekele or pass by the Camel train in the car arriving there within a day.You may opt to visit one or two of the famous Gare Alta churches of Tigray on your way back. If you have a head for heights you may climb up to the highest churches to appreciate the view from the top of the mountains. The choice is yours. 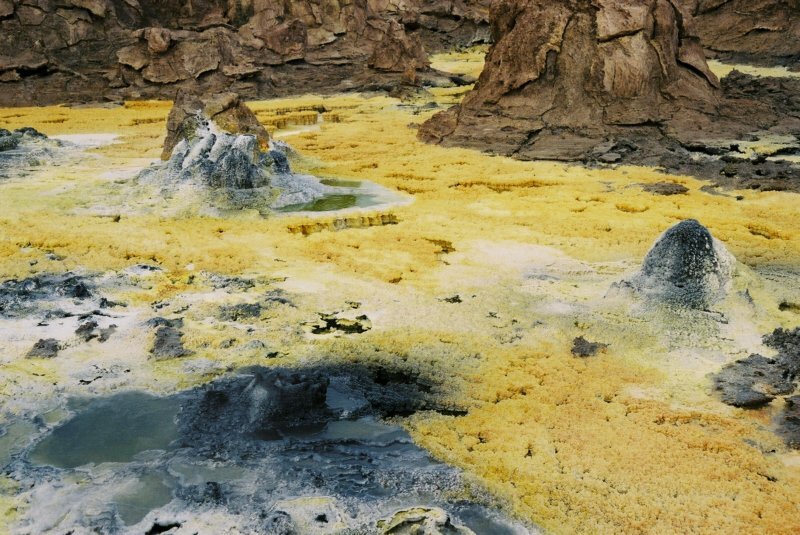 The Dallol will exceed all your expectations: fantastic scenery, sulphur springs,colourful mineral deposits and the salt lake area itself. 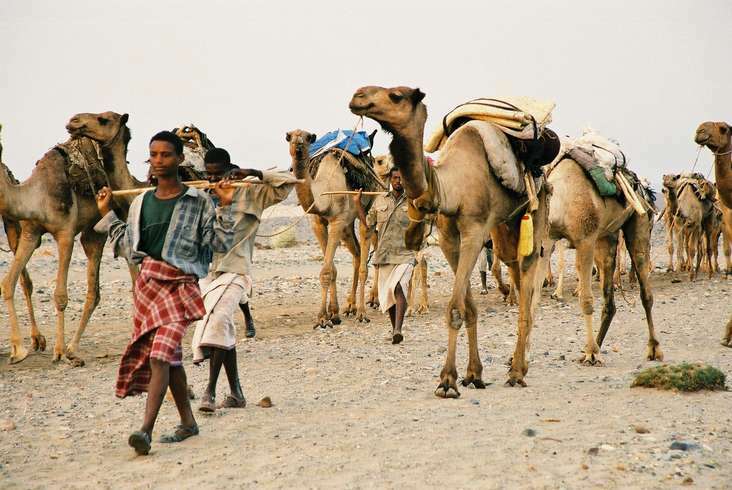 However, nothing will match the wake up call of the 400 camels passing your tent in the early morning on the way to the salt cutting. 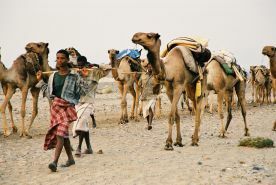 October - early January is the coolest time when you are likely to see the most camels. Please contact us via our e-mail sol2rs@yahoo.com for further information about costs and available dates. 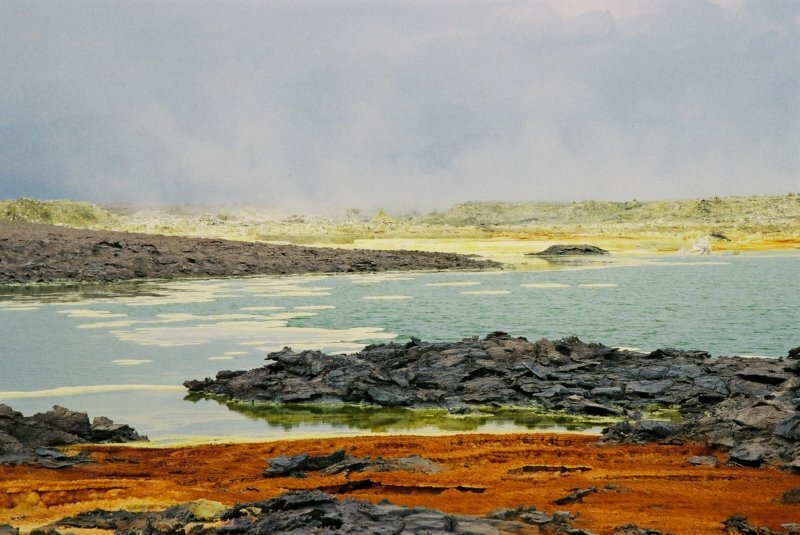 Solomon was featured in a BBC Radio 4 documentary on the Danakil in 2006. Day 1 Depart Heathrow, fly overnight. Day 2 Arrive Addis Ababa. Overnight Hotel in Addis Ababa. Optional City Tour. Day 3 Drive to Awash National Park. Overnight in Awash Park camping or Genet hotel in Awash . Day 4 Drive to Asaita, Lunch at Mile en route. 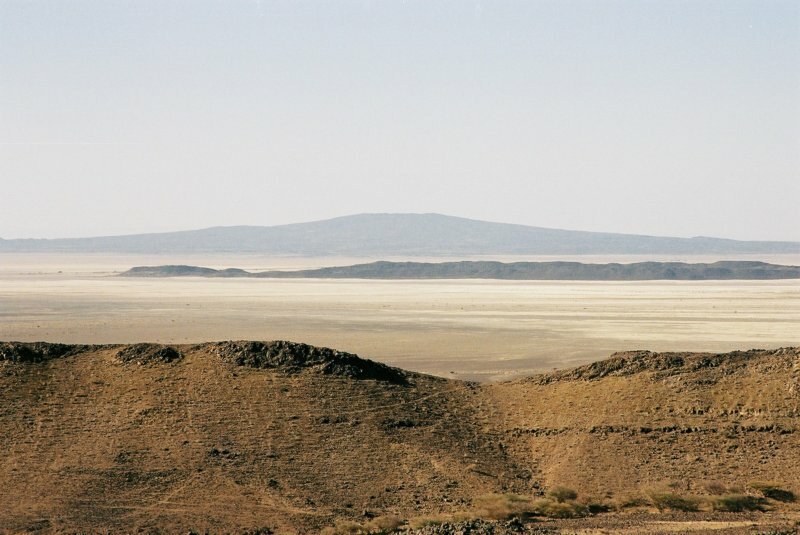 Arrive a tbasic hotel by about 4p.m.Nice journey through the landscape of The Rift Valley. A chance to see Wildlife and Birdlife on the way. Day 5 Continue on to Afrera. 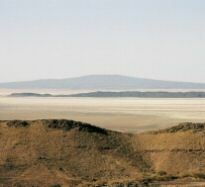 Camping overnight, desert area of the Afar Region. Day 6 Cross via a relatively unexplored route to a campsite from which we trek or ride camels to the Volcano. Set up main campsite with vehicle support. Day 7 Early start towards the site of the Volcano with all necessary food and water. Camping Overnight. Day 8 Time to explore the area around the Volcano at group's discretion. Day 9 Return to main Campsite and vehicles. Day 10 Drive to Ahamedela Camp. 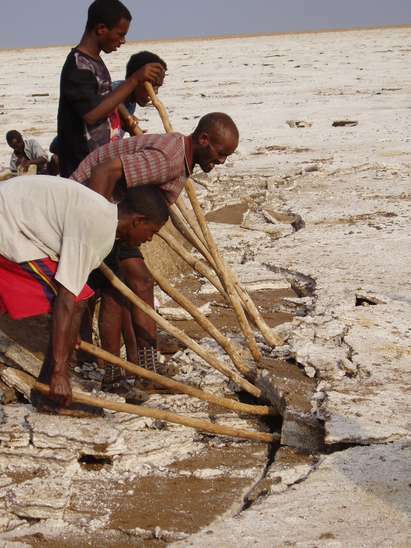 This is a 3 to4 hours hard walk away from the salt mining area. Day 11 Very early morning start to walk to the site of the cutting of the blocks of salt to be transported by camel to Mekele. Return to Ahamedela Camp the same day. Interesting, but long hot day. Day 12 Early morning drive to the Dallol Depression, the lowest point on Earth. Return to Ahamedela Camp and continuedriving on up to Berahile. Camp Overnight at Berahile. Day 13 Drive to Mekele to arrive at lunchtime. Overnight in comfortable Hotel. Day 14 Fly to Addis Ababa. Overnight Hotel.